Zehender was a painter of German origin, but little is known of his life or artistic activities. He worked in the first half of the 16th century and has been associated with woodcuts by the Master of the Monogram GZ that reveal the marked influence of Dürer and Hans Baldung Grien. The artist’s output and personality were reconstructed by scholars such as Alfred Stange and Hans Koegler in the 1970s and 1980s. The present portrait is his only known painting. It depicts a couple painted on a single panel, a format that was relatively common in 15th-century German and Flemish painting and one particularly appreciated by clients. The couple are depicted bust-length, standing out against a striking red background on which their ages and initials are inscribed. The man, whose features are depicted with notable realism, occupies the foreground. The woman, located in the middle-ground, is depicted using a softer type of modelling. The composition has been compared to another of the same type by Jan Gossaert in the National Gallery, London, suggesting that both may be based on the same model. The artistic personality of Gabriel Zehender has been established over the course of the last century, although much about his life and work remains unknown. It would seem that he was from the city of Grossmausdorf, and is documented in Basel between about 1527 and 1535. He was admitted to the city’s painters’ guild in 1529. His name has been associated with various prints in which the monogram gz appears, datable to 1517 to 1521 and published in Basel, Strasburg and Hagenau. Zehender’s oeuvre has been expanded by Alfred Stange who attributed to him a series of portrait drawings, and Hans Koegler who compiled the artist’s prints. This initial corpus was the subject of considerable debate by experts who revised and expanded it in the 1970s and 1980s. The present panel was in the collection of Arthur Erlanger in New York, passing from there to the Becker collection in Dortmund. It was acquired by the Cramer gallery in The Hague in 1975 and from there entered the Thyssen-Bornemisza collection. 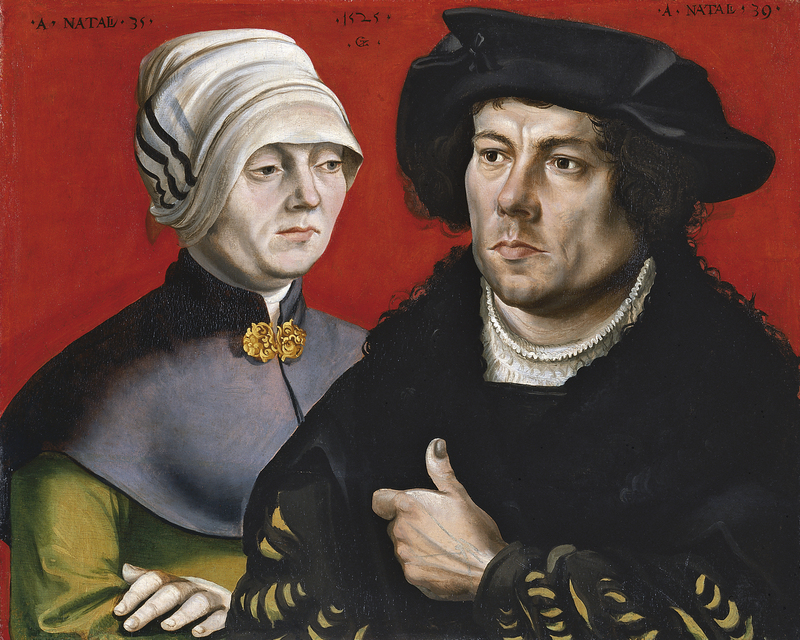 The panel depicts a married couple in a single image, a format developed in German art and popular with clients. 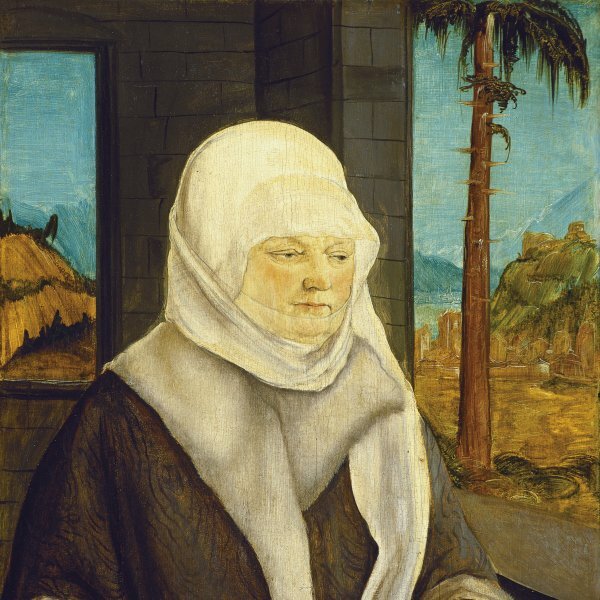 Examples of double portraits are also to be found in 15th-century Flemish art. Hans Memling, who was German by origin, chose this format to depict an elderly couple whose images were later separated and are now displayed in two different museums. Using a strong red background, Zehender depicts a married couple bust-length, with their ages, initials and the date of the painting inscribed at the top. The bold figure of the man occupies the foreground space on the right while the woman occupies a secondary plane of the left, partly hidden behind her husband. The drawing used to define the man is hard and firm and his features are shown as severe. Through their expressions and poses Zehender conveys the sense of a cold relationship in which the woman seems to be absent from reality and absorbed in herself. A similar effect was achieved by Jan Gossaert in his double portrait of an elderly couple (National Gallery, London). The similarities between that composition and the present one have suggested the idea that both paintings were based on a lost prototype or that both painters arrived at similar solutions for the presentation of this particular subject.